*I just think those are the cutest faces ever!! 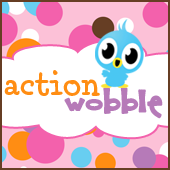 *I added 2 wobbles. The card still wobbles, but it's shorter stiffer wobble. It was perfect for just getting the glitter inside the shaker part to move around!